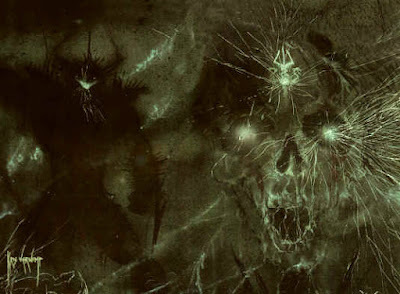 Creator god, god of beasts and orcs, Baragnagor is a degenerate mad god of chaos who stole the forms of other creation to cobble together his own people. Baragnagor is regarded as the degenerate brother of Dalroth and Slithotep, a beast neither subtle nor graceful in its desire to consume, destroy and hunt. He is the oldest identified deity in the orcish pantheon (though Set is older, orcs did not embrace the worship of the serpent god until much later). Baragnagor’s cults harbor shrines that look like brutal charnel pits where prey from sacred hunts are cast in to carefully tended beasts, usually carnivorous monsters or natural animals such as bears and crocodiles, to feast on the flesh of the kill in the god’s honor. War chiefs of the orcs often revere these beasts as both aspects of their god and dear pets. The female fertility goddess of orcish women, rarely spoken of as her secretive cults among the orcish women preserve her worship carefully and keep male orcs away. Zafethra was described as the first orcish woman, and in their folktales it was lust for this goddess that prompted Barganagor to seek to shape his own form to lure her to lay with him. In the end, it was their progeny which became the first orcs. Zafethra’s cult teaches a variety of skills such as midwifery, medicine and healing but certain members of the order belong to a subcult of assassins known as the Jagged Blades, and carry out executions against those who would affront the cult. 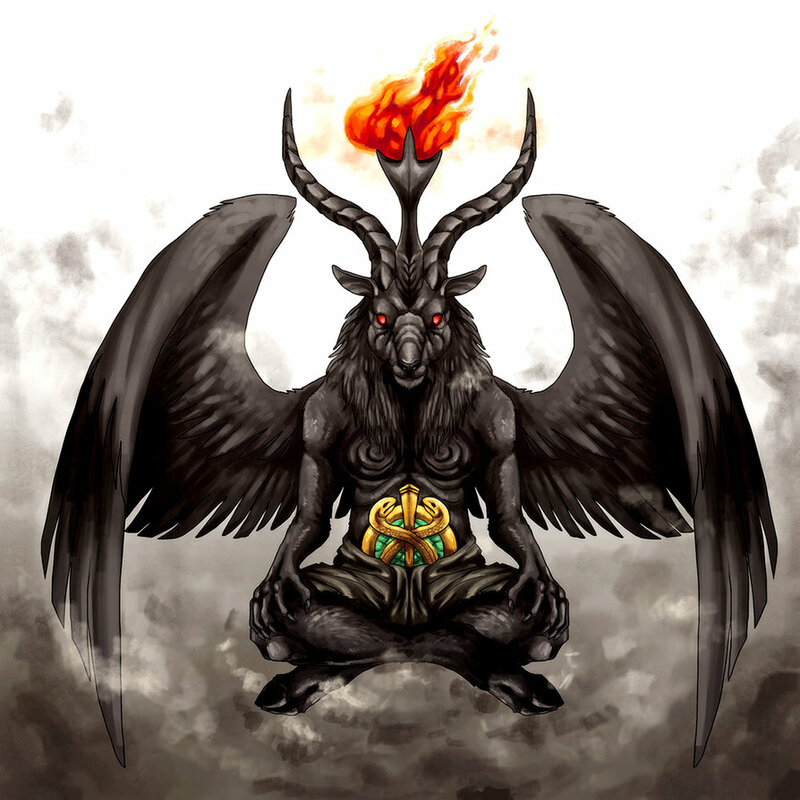 The demon god Baphomet is identified as the being which first taught orcs the art of magic. Prior to Baphomet’s intrusion into orcish belief, Baphomet was an enigmatic figure, a winged, goat-headed beast which was recognized by demonic witch covens in Hyrkania during the early years of the rise of the young empire, but otherwise a human cult. It is believed that the Thyzzakoni, the red orcs, first embraced the worship of this demon and so were given over to the mystical traditions of chaos magic granted by the demon god. Today, most of the cults of Baphomet can be found in many orcish cultures, but they remain most profound among the red orcs, so regard the demon god almost as highly as they do Set. 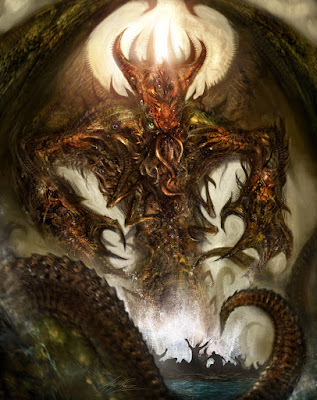 Orcus is seen as the gatekeeper of the dead, and while Orcus is most definitely a demon god of undeath in conventional human worship, Orcus represents the gateway to the Abyssal legions for the orcs. Orc belief states that one must appease Orcus to gain entry into the gates of the Layers of the Abyss, and to achieve this reward is the highest honor an orc can hope for (short of becoming a true demon in the afterworld). To be rejected by Orcus is to fail, and return to the mortal plane as an undead. Set is a god worshipped in Old Galonia, Zued and other lands by humans, and a patron god of the serpent men of Hazer-Phennis, but the Thyzzakoni red orcs also worship Set, and seek to promote his religion throughout the many clans of orcs. Set is regarded with suspicion, but the power the god bestows on his clerical followers is given much weight among the orcs, who grudgingly accept that the Lord of Lies is nonetheless also a valuable deity to be protected by. Most orcs get very suspicious of red orcs who will then invite serpent men into the mix, for despite the assertion that the serpent men are the created race of Set, most orcs have a deep mistrust of the serpentine race. 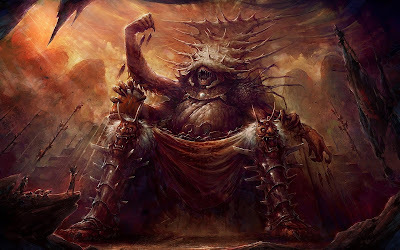 The Kraken, one of the ancient pre-human gods of old chaos (the Skaeddrath) still trapped within the crust of the world, periodically reaches out with dreams and nightmares to gain new followers. The last major incursion of followers happened at Old Chegga, but enclaves of dedicated followers exist throughout Octzel. These orcs throw aside all other beliefs and embrace the Kraken exclusively, almost monotheistically, and seek to appease the dark god by finding portals in the Under Realms through which they can feed the dark beast with sacrifice. The followers gain strange powers, often mutating in horrible ways as a result. Seth is not related to Set in Lingusia but is a deity alleged in the human pantheon to have been born of Amasyr and Enki. 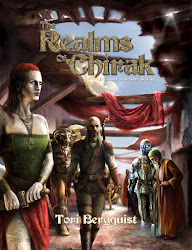 Orcs regard Seth as one of their own, and some orcs, especially the Grey Orc tribes to the south, revere him as a protector god who liberated them from the taint of Baragnagor. These orcs continue to engage in their primal ways, but tempered by the teachings of this god who is a lord of weather and the harvests. 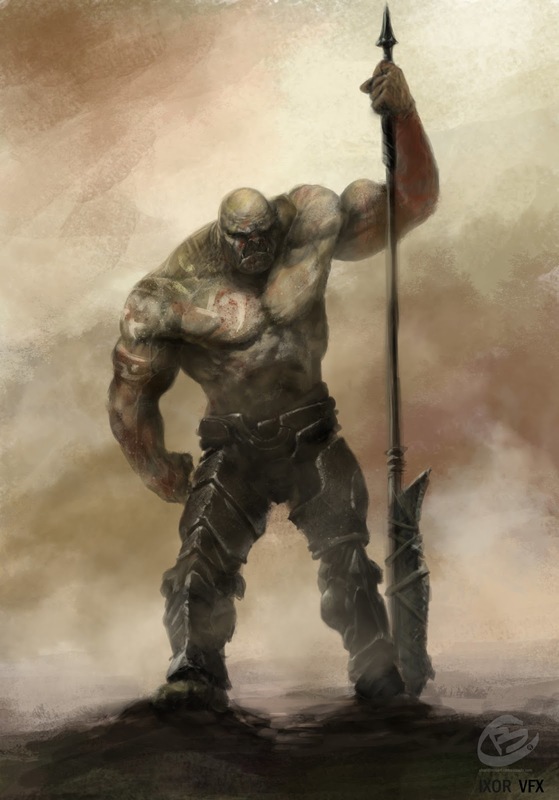 The orcish version of Seth is seen as a benevolent giant orc, whom they claim was born of Zafethra and Baragnagor as a demigod, but was raised by the human gods Enki and Amasyr as their own child. In the old era before the rise of Imperial Hyrkania Seth learned of writing and civilization, and brought it to the orcs, making them more than the beasts their god had spawned them to be. Followers of Seth believe their kind have lost their way, and believe that the orcish language is proof of Seth’s influence. 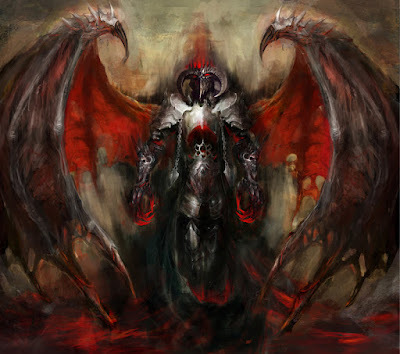 The demonic half-brother of Orcus according to some, this ancient demon lord was banished to the mortal realm long ago, and it is said in his early years of wandering that his amorous ways led to the birth of the first of the Fell Manorg, the black orcs. These demon-touched orcs are exceptionally strong and powerful, sometimes mistaken for ogres except for their charred flesh. Orchraiste is regarded as more of a folk figure in orcish belief, and his current whereabouts as a demon banished to the mortal plane remains a mystery (to most). This is pretty cool. I like what you have done here. Very interesting ways to bring Orcus and Baphomet into the pantheon. 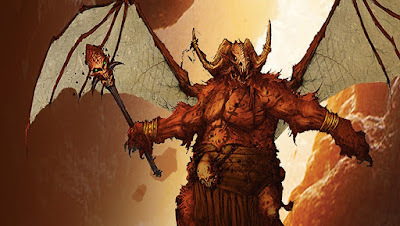 Yeah my current 13th Age campaign is focusing on an orcish warlord and his demon-possessed vizier who both revere Baphomet so I'll be exploring this cult in greater detail....reading up on the historical Baphomet to get more authenticity in the mix. Wonder Woman Trailer #2 -- Looking Great!